Even with seven months of the lightest duty of their careers, Elizabeth and Philip are still as red as ever. That's right, there was a big time jump during The Americans Season 4 Episode 8. Right about the time Philip and Elizabeth were giving their very best angsty teenagers impressions, Gabriel and Claudia decided it was time for the couple to go on hiatus. Without being in touch with the Jennings for seven months, the only hint we have of who they've become after all their time off is their check-in with Paige. It's just as important now as it was before their break for Paige to be in constant contact with Pastor Tim and his wife. We can assume from the bright and cheerful smile on her face as she delivered her report that she's following the directive she received from Elizabeth when she at first thought it was OK to miss a day of bible study. When Paige learned that the reason she's now responsible for all of the joy and happiness between Pastor and Mrs. Tim is because her terrible decision put here there and made her responsible for thwarting the destruction for the entire family. Good times. While Elizabeth mingles with the kindly Young-Hee, sharing girly moments, crying at Tender Mercies and skipping into a theater to see The Outsiders free of charge, we were reminded of one of the possibilities of Young-Hee's future. Lisa was back, her life a mess. There's a reason these people are vulnerable to con artists like Elizabeth and Philip, and their endings are not usually happy. We saw what happened to Martha. Off to the sunny shores of God knows where with all her good friends and family. She wishes. She's probably just hoping to stay alive. Lisa wasn't so lucky. She finally realized what Shel and Jack were doing for her and her husband wasn't all that cool. If they went to the police together, they could get immunity and take Jack down. Or Elizabeth could kill her, which is the other option awaiting Pastor Tim and his family if Paige lets them get crazy notions into their heads. Why? Because KGB agents aren't the nice and fuzzy people they portray to the people they recruit. That's what's been eating Philip up inside, especially while he attending est meetings. After saying goodbye to Martha, he was flippantly considering what's next. Playing hockey again was among his plans. Tending his own garden for a change, something they really don't get to do in their line of work. Something that's very American. Up until that time jump, Philip was still reeling over what happened with Martha and what it meant to lose her as a confident. He didn't hesitate to inform Elizabeth Martha wasn't simple, but in fact complicated and underestimated by most. He wasn't going to let her parents go without knowledge of her whereabouts, either, despite what Gabriel said was the norm. In fact, Philip rolled right over news of his son to discuss news of Martha and informing her parents. That's how deeply plagued Philip was about Martha. How plagued was Elizabeth by Martha? She went to est. Although she looked quite intrigued during the seminar, and I fully expected her to continue going based upon the casting of her est leader (Scott William Winters), she didn't take the right tact about attending when discussing it with Philip. She started the conversation on the right foot, and if she had continued in that vein, she could have brought up the pyramid scheme feel of the whole thing a little later. Instead, they launched into a massive argument about human beings vs agents, Elizabeth's past with Gregory and the woman Philip slept with who gave him his son. It was after that argument when things spiraled out of control and the show rolled into the seven month time jump. Gaad was relieved of his position at the FBI, but he can't stop thinking of ways to get his man. In seven months, we can assume Stan never looked at Philip with any kind of recognition from the crude drawing in connection of Clark Westerfeld. I'm dying to know what happens next, though. 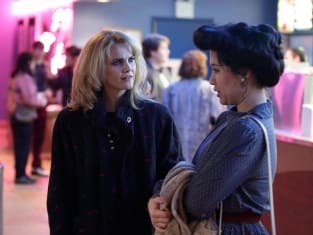 Especially because The Americans Season 4 Episode 9 is named after one of the most defining moments of my youth; when The Day After aired on television. If you have never seen it, you can watch below. It's available on YouTube. While it might seem cheesy now, you have to try to put yourself into context with the times. There was nothing like it, and it was on broadcast television. Watch it before the new episode! If we weren't afraid of the Soviets before that movie was released, we sure as hell were afterward. Yet, I don't remember David Copperfield making the Statue of Liberty disappear at all. Magic was never my thing (although I did see Siegfried & Roy in Vegas in their heyday...OMG). What do you think the Jennings went through during their break from the spy game? Did they travel to Epcot? Did Philip take up hockey again (on the ice, as well as in the driveway)? Did Elizabeth continue going to est? Did Philip? Did Martha make it to her final destination? What's next? 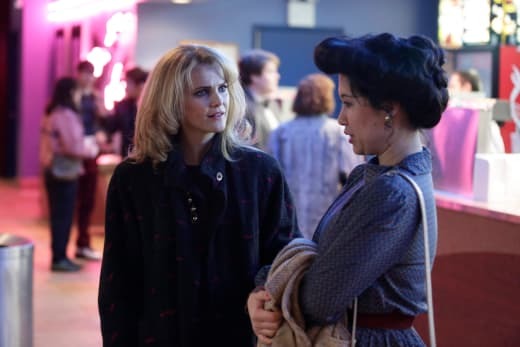 If you want to see more pre-time jump material, you can watch The Americans online right here via TV Fanatic.